Sussex Clock. Optic Crystal. Uses SR626SW or #377 battery (available at Radio Shack). Battery included. 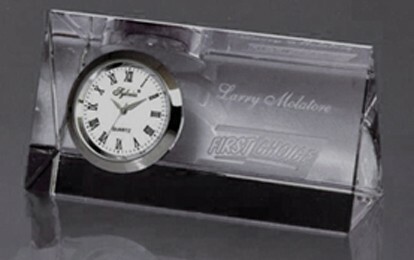 Nameplate Desk Clock. Optic Crystal. Uses SR626SW or #377 battery (available at Radio Shack). Battery Included. Piccadilly Desk Clock. Optic Crystal. Uses SR626SW or #377 battery (available at Radio Shack). Battery Included. Branchbrook Park Clock. Small. Optic Crystal. Uses SR626SW or #377 battery (available at Radio Shack). Battery Included. 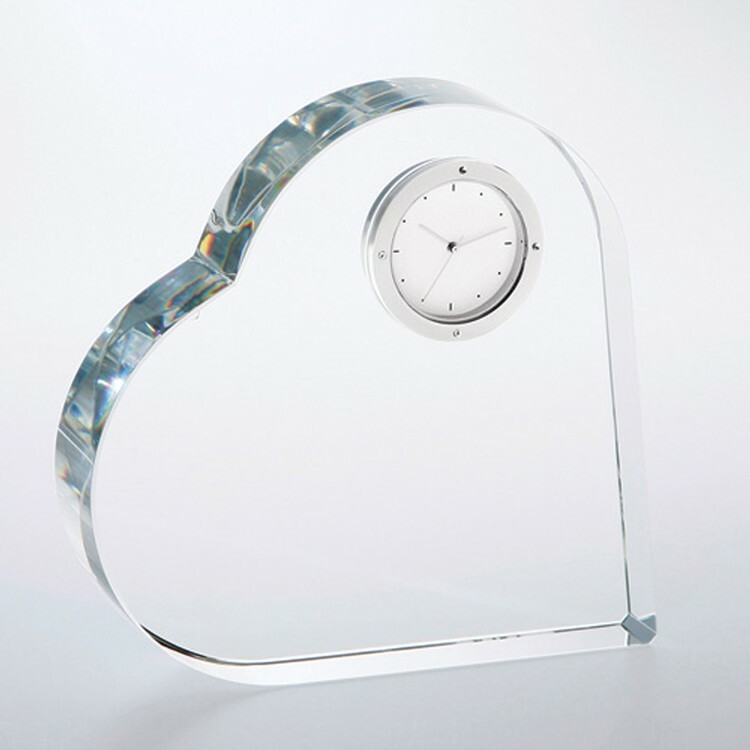 Mirage Clock. Large. Optic Crystal. Uses SR626SW or #377 battery (available at Radio Shack). Battery Included. Avondale Oval Clock. Faceted Optic Crystal. Uses SR626SW or #377 battery (available at Radio Shack). 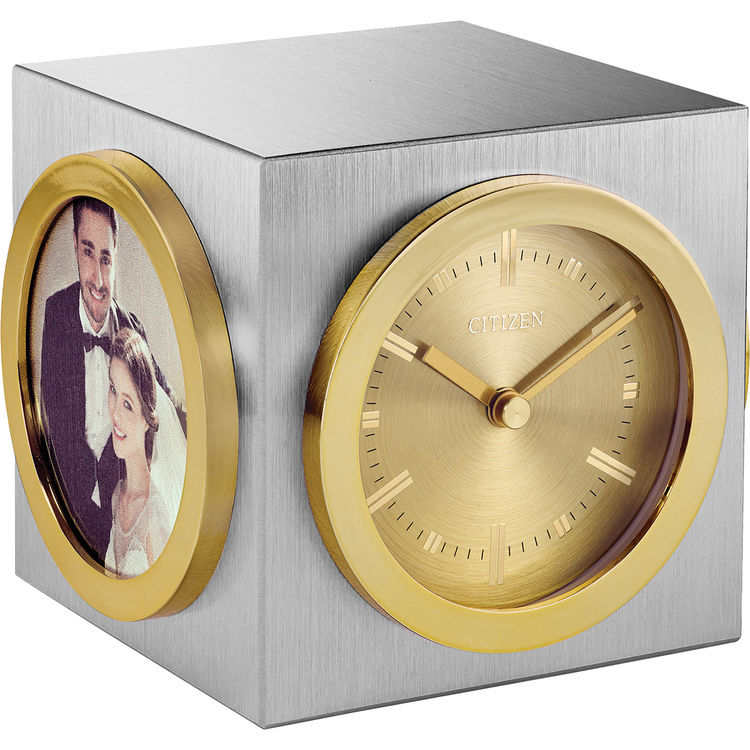 Battery Included..
CITIZEN Workplace silver-tone and gold-tone cube with one clock and three picture frames and custom engravable plaque. Step second hand. 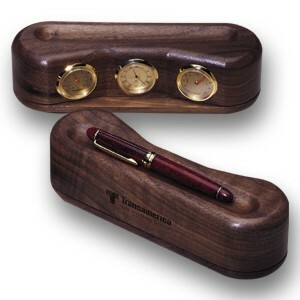 Elegance, design and function blend into harmony in this wood international time instrument. If your company is constantly working in different time zones, then consider model 1475-3c. 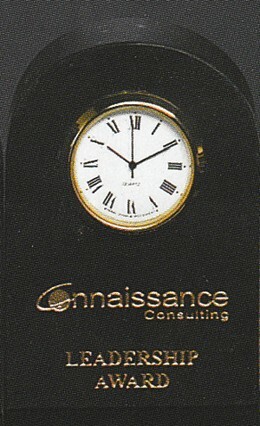 We insert three golden quartz clocks and we laser any three time zones, at no additional cost. 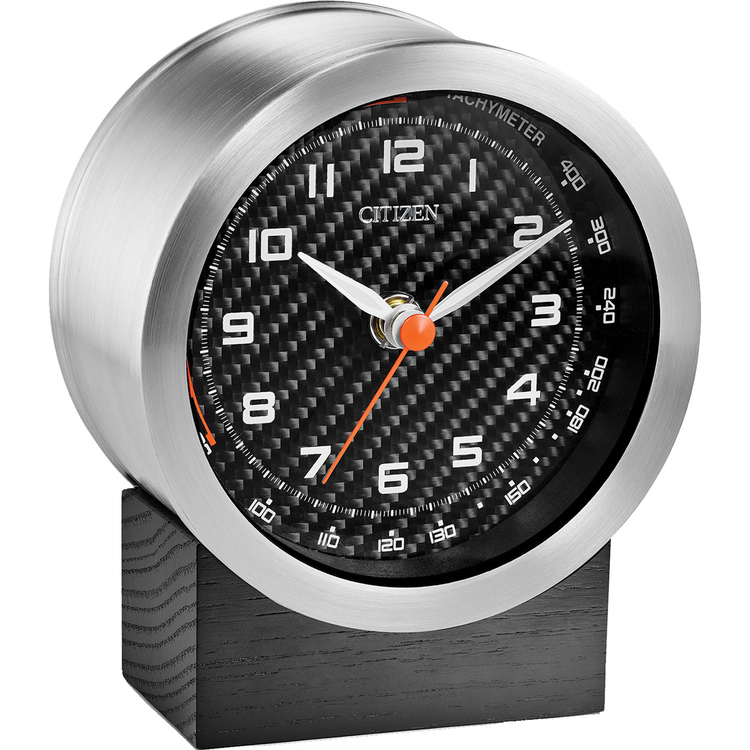 CITIZEN Workplace round silver-tone clock with carbon fiber dial on a black solid oak base, and custom engravable plaque. Bluetooth speaker with 4 hour playing time with ability to sync with phone (any Bluetooth-enabled device). Sweep secodn hand. 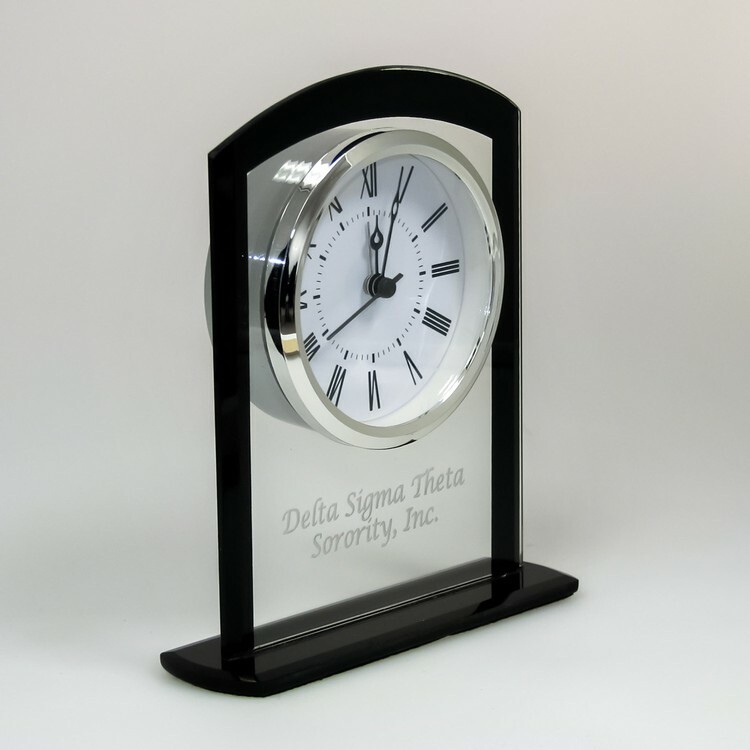 High perceived value and clean design lines define this new quartz desk clock with alarm feature. 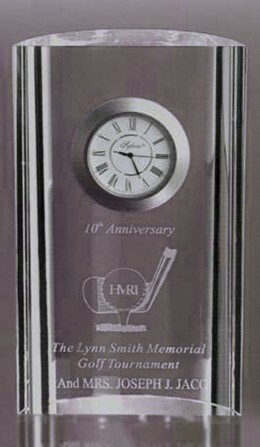 The glass panel with black trimming blends smoothly into the polished black bottom base. The quality quartz analog movement has a sweep second hand with roman numerals on the white dial face. 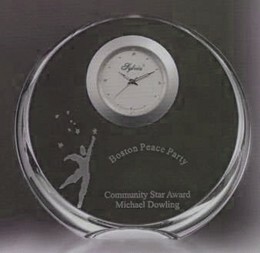 The laser etching is on the backside of the glass panel to add dimension. One "AA" battery is included. 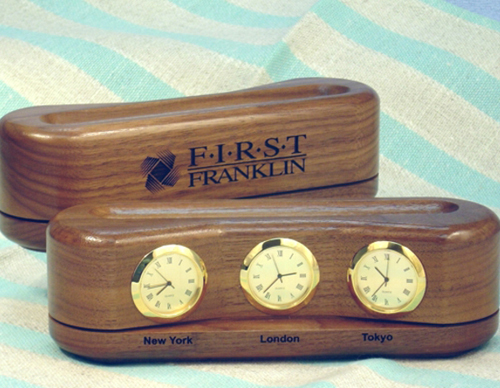 Elegance, design and function blend into harmony in this 3 instrument wood weather station. 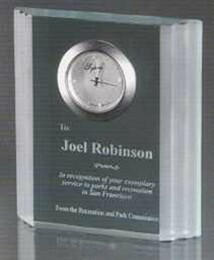 A quartz clock is centrally located between the thermometer and hygrometer. The pen is not included. 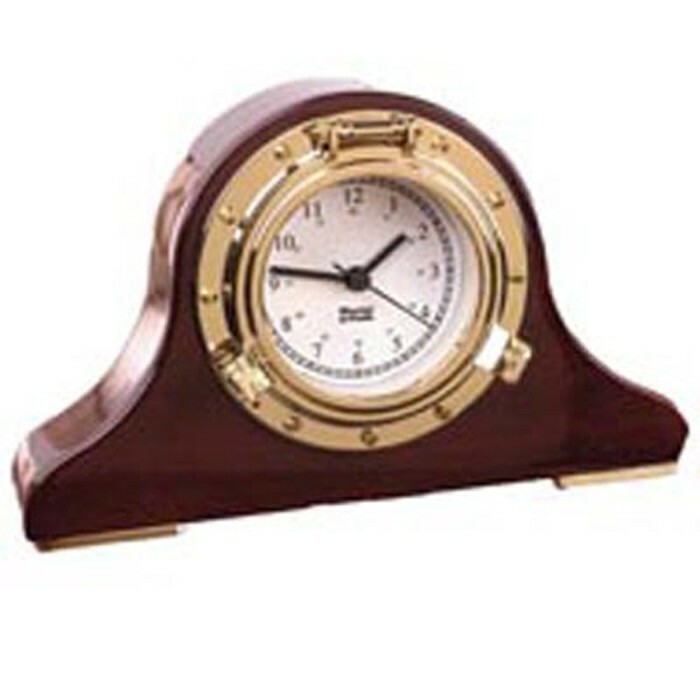 Nautical Desk Clock. 6-1/2"h x 2-3/4"w x 1-1/2"d. Elegantly Finished North American Hardwood. Solid Brass (Metal Parts). Engraving on Solid Brass Plate. 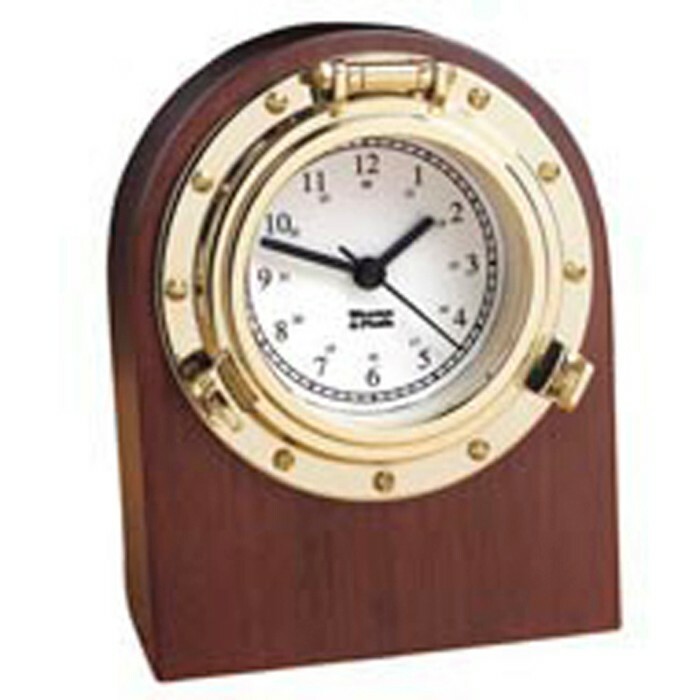 Maritime Desk Clock. 4-5/8"h x 5-1/4"w x 5-1/4"d. Solid Brass. Glass: 3-3/4"diameter. Tiara Clock. 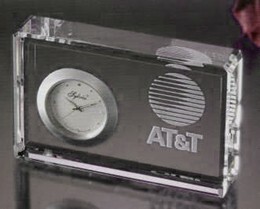 Optic Crystal.Uses SR626SW or #377 battery (available at Radio Shack). Battery Included. Branchbrook Park Clock. Medium. Optic Crystal. Uses SR626SW or #377 battery (available at Radio Shack). Battery Included. 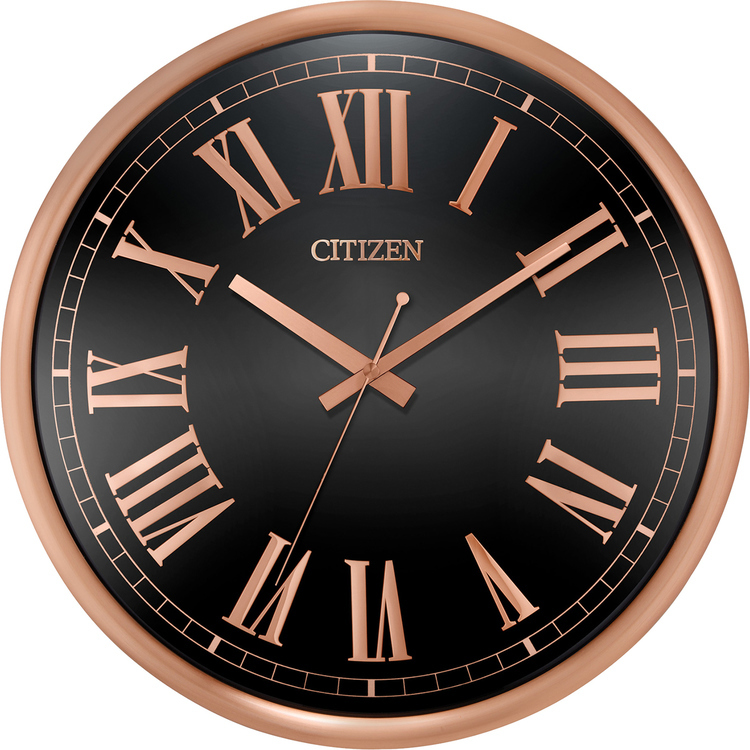 CITIZEN Gallery circular clock in rose-gold tone with black dial and roman numeral markers. Sweep second hand. Waterflow Clock. Jade Glass. Uses SR626SW or #377 battery (available at Radio Shack). Battery Included. Some say timeless, we prefer timely. 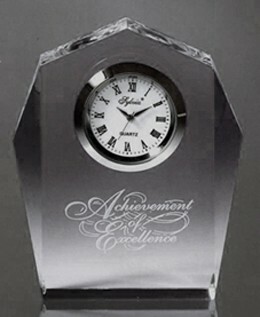 A traditional mantle or bookcase clock design which defines and rewards high levels of achievement that surpass the test of time. The USA made movement is powered by a single "AA" battery, which is included. 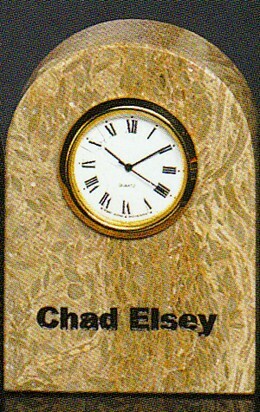 Select your preferred wood finish and clock face. 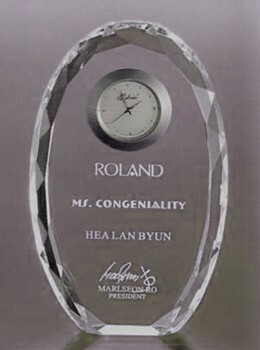 Heartstring Clock Award. Optic Crystal. 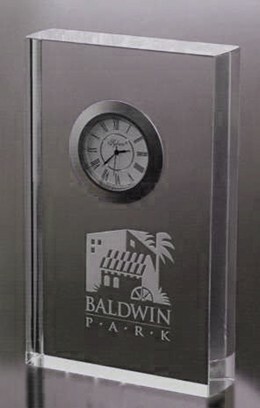 Branchbrook Park Clock. Large. Optic Crystal. Uses SR626SW or #377 battery (available at Radio Shack). Battery Included. 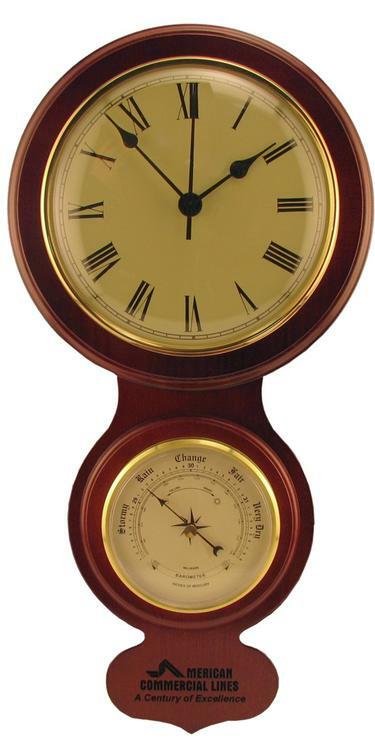 The wood wall clock by itself is an elegant piece that really sells itself. 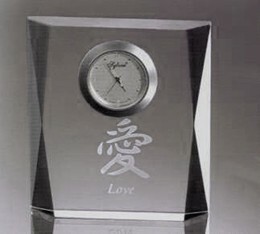 Not only do you have the beautiful clock, but also a barometer as well. Anyone would love to hang this on their wall displayed with their company name or ad copy of their choosing! Nautical Mantel Clock. 5"h x 8"w x 3"d. Elegantly Finished North American Hardwood. Solid Brass (Metal Parts). 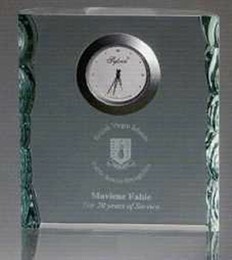 Engraving on Solid Brass Plate. 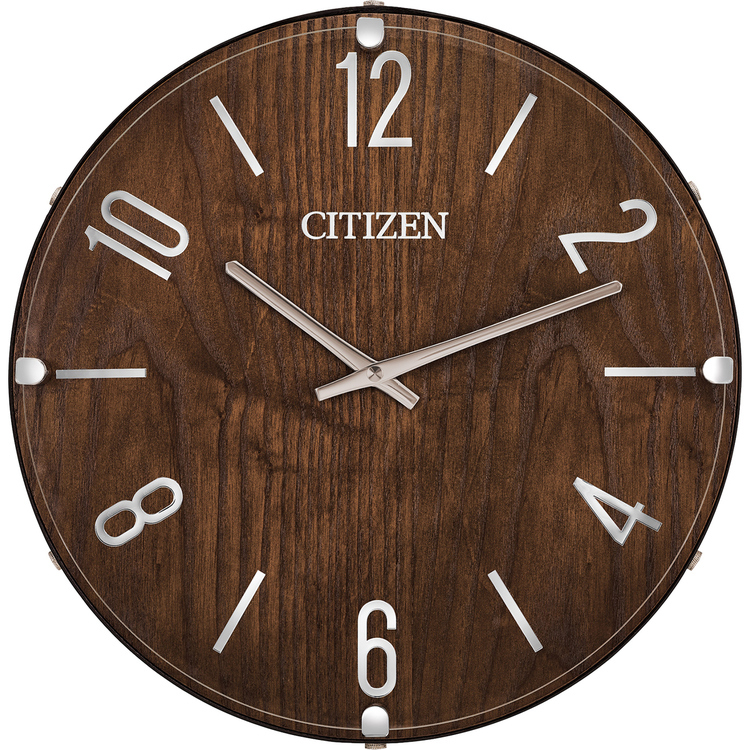 CITIZEN Gallery circular wall clock in dark wood frame, with silver-tone markers and hands, and brown leather accent encapsulating the clock. Step second hand. 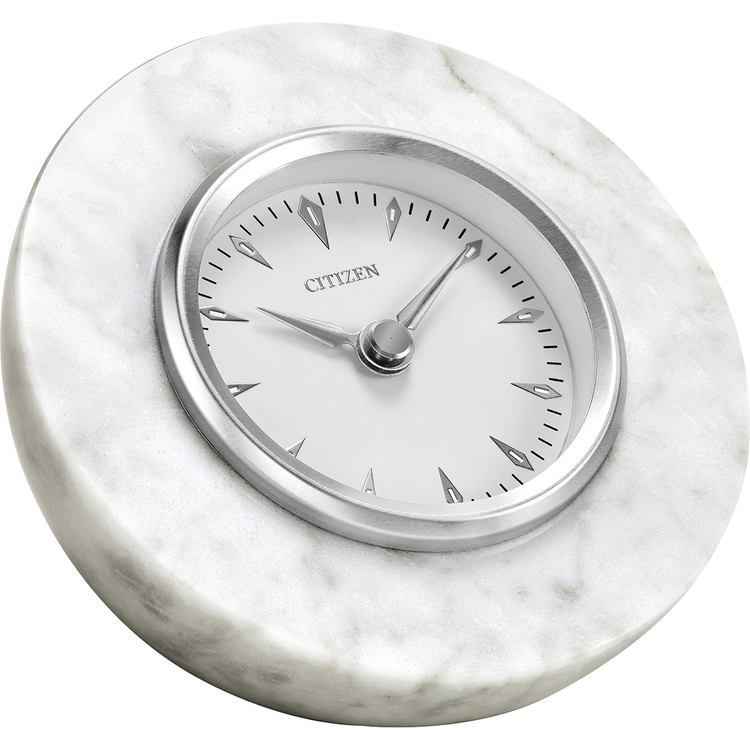 CITIZEN Decorative genuine white marble half sphere clock with white dial and silver-tone frame and markers. Step second hand. Waterfall Clock. Jade Glass. Uses SR626SW or #377 battery (available at Radio Shack). Battery Included. 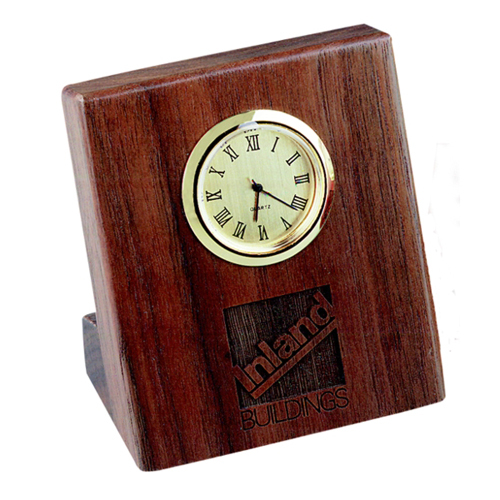 A high quality, easy to read desk clock that doesn't take a lot of space, just a lot of compliments. 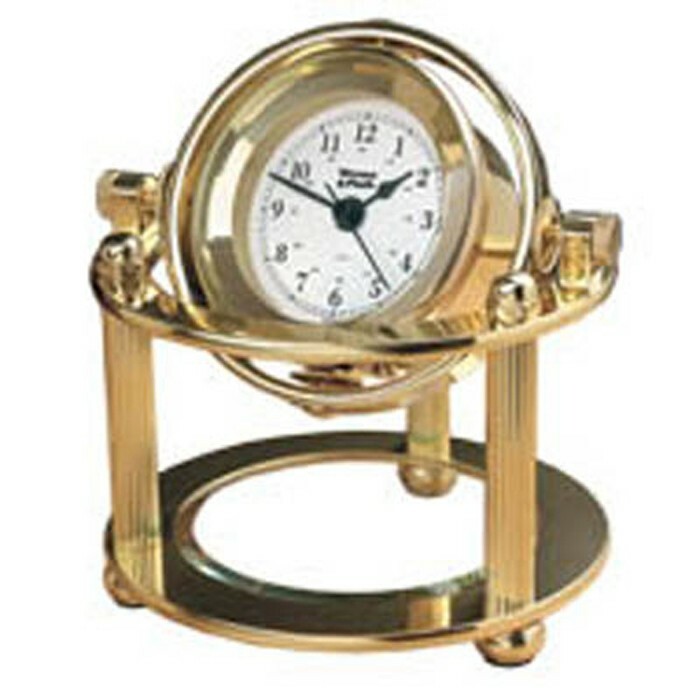 The gold plated, quartz analog clock rests at the perfect viewing angle. It's time for your name to get the attention it deserves. Two year guarantee on the clock movement. Battery included. Empire State Clock. Optic Crystal. Uses SR626SW or #377 battery (available at Radio Shack). Battery Included.